I can't decide if Slender Man is now less scary, or tap dancing is now more scary. My friend downloaded and played Slender while I was over at her house yesterday. At one point, she had to clean dog hair out of her yogurt (don't ask). I warned her that the AI of the game makes Slendy move closer and closer to you if you stay still. We only had one note, so we sat there for about five minutes while she cleaned her yogurt. Then, all of a sudden, the camera panned by itself and BOOM! Slenderman in the face. ;_; We both screamed at the top of our lungs. Her 65 pound black Labrador came barreling down the stairs, barking and snarling because she thought her family was being attacked. The more recent update makes it even scarier. Oh God what? Use spoiler tags if you must. Well it has fog, for starters. And I believe the Slender Man is more aggressive. On the other hand, I believe your character no longer has crippling asthma and can run for more than a half of a second. I've heard they added tentacles for him. But again, I've seen a let's play of the game and I decided to not play it by myself. I'm not that brave. They did add tentacles. I watched a video of the new update on YouTube. Personally, I think Slendy's a little overdone now. I mean, you run into him like every 30 seconds. You can't build up suspense for a complete jumpscare when he's following you around like a lost puppy. Just got the DVDs for Marble Hornets seasons one and two today. Gonna get my parents to watch them. Also, there's this really good Slender Man song on iTunes. It's called Gone Gone Gone (the Slender Man Song). 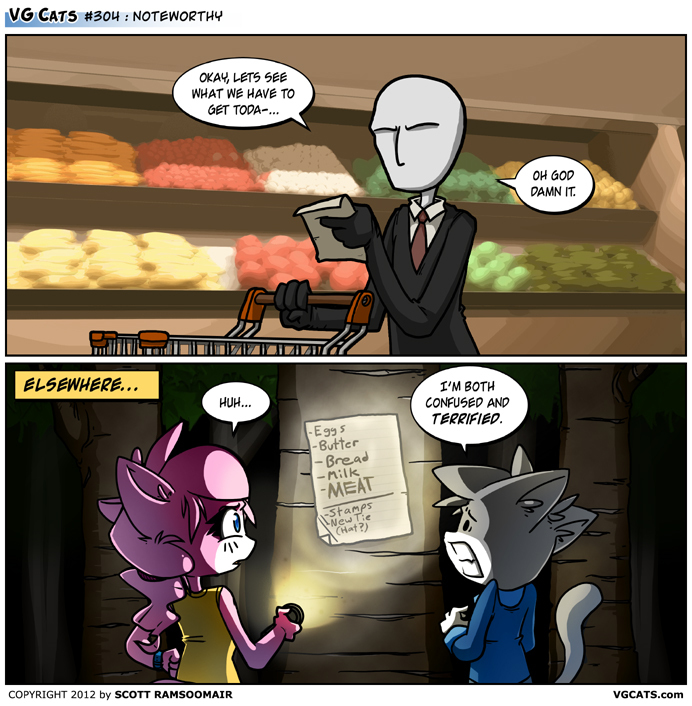 I learned about Slender Man a couple of weeks ago... Pretty creepy dude... I also watched the marble hornets videos on YouTube and I liked them a lot. Some of them were pretty scary, especially entry #60. I would be thankful if someone summed it up for me what is Marble Hornets? Marble Hornets. The story of a man looking through the raw footage a missing friend shot for a movie years before, slowly discovering whatever horror it was that drove his friend into hiding...or worse. Does that sound like an accurate assessment of the first season, anyone? I got up to Entry #20 in that series and got bored with it. Is it worth finishing? Now if only I knew what now makes sense. It's creepy yet awesome how well that fits. Oh my God!!! That's Amazing!!! Oh, I hate these stories, and I have not ever been able to read one of these since I read a really horrific tale of a pychopathic murderer. That story was truly the most horrible thing I have ever read, and makes me cringe to remember it. But what was most disturbing of all is that someone in this world would dream up something like that. That same picture was on my friend's timeline a few weeks ago!! You know, I think the pictures of Slenderman without the tentacles are creeper. The tentacles are just over-kill. It's just adding too much onto something that should be scary because he's there, not because of what he does. I agree. I like the minimalism of it. 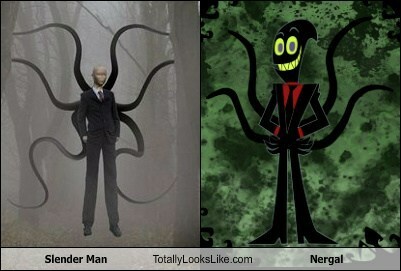 I agree that, in general, Slender Man's creepier without tentacles. However, I also think the tentacles can work if done right. Edit: also, I'm nearly finished with the first draft of a Slender Man short short story. I decided to not do a full Slender Man novel, but an anthology of three Slender Man stories. Who wants a look at the first draft of this one story? Okie dokie lokie! Now, uh, send it through notes? This video is relevant to my interests. Hey, look who I drawed. Funny story behind this. I was trying to draw a hand gesture (the a-Okay one, or an F in Sign Language) and the thumb looked like an arm, the pointer finger looked like a leg walking, and the middle finger looked like the other leg. So I erased the rest of the hand, made the thumb longer, and made Mr. 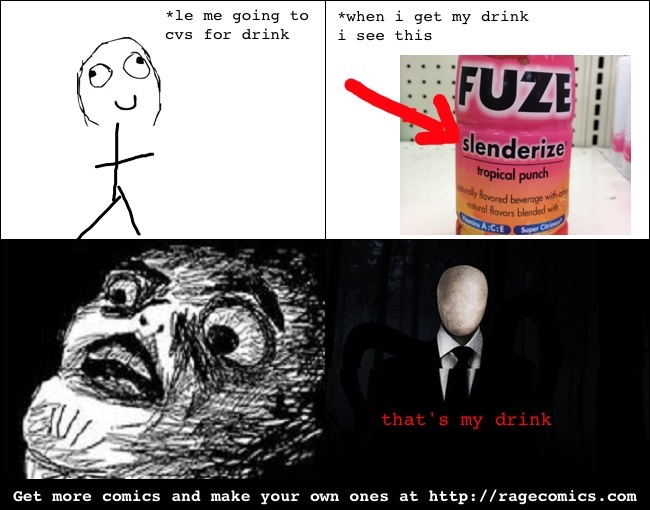 Slendy!!! geez, i just played a game about this guy and found out this meme was around for about 3 years now. Wheeeeeeee! It's not really a 'meme', 's a creepypasta! Speaking of, quick question. Since he's appeared numerous times and played a somewhat key role in EverymanHybrid, is the Rake open to discussion around here? Part two of Rage Quit's Sleder video is out, and it is hilarious. I wrote a poem about Slender man. It contains a warning message.